Lenovo gave its mobile workstations major performance boosts today, unveiling a pair of models at the SIGGRAPH 2015 show. Even though the new laptops carry the same design aesthetics as Lenovo's ThinkPad W541, these mobile powerhouses are the first to feature Intel's Xeon processors. The two models include a 17.3-inch ThinkPad P70 and a 15.6-inch ThinkPad P50. 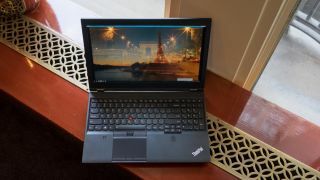 Both models usher in the end of Lenovo's ThinkPad W series as Lenovo begins standardizing on the P Series brand, for power, performance and ports. Popular models in the W Series in the past include the ThinkPad W540, ThinkPad W541 and ThinkPad W550s. The W Series hasn't seen a major power upgrade for some time, forcing users to choose between models with an older and more powerful quad-core Haswell processor or the newer and more energy efficient dual-core Broadwell chip from Intel. Under the P Series, with a brand new Intel Sixth Generation Skylake processor mobile Xeon chip, users no longer have to make the compromise between power and performance. The ThinkPad P70 is the flagship model in Lenovo's new P Series and brings a number of firsts to the ThinkPad line. It's the first mobile workstation to feature a 17.3-inch screen, as prior models have maxed out at a 15-inch display. It's also the first to feature a high resolution 4K UHD display, besting the 3K screens on older models. Power users will also appreciate that the P70 can be maxed out with a 2TB hard disk drive and 1TB SSD for a total of 3TB storage, 64GB DDR4 RAM, swappable optical drive bay and Nvidia Quadro graphics. The ThinkPad P70 and the smaller P50 both come with Intel Sixth Generation Skylake or Xeon family processors. In an interview with TechRadar, Brooks Flynn, Worldwide Segment Marketing Manager at Lenovo, would not give specifics about the Quadro graphics. Instead, Flynn told us to confirm the information with Nvidia, leading us to speculate that this may be a new and unannounced GPU. One of the highlights of the P70 is that it comes with plenty of ports. The laptop accommodates HDMI 1.4, Mini DisplayPort 1.2, Ethernet, docking connector, headphone and microphone combo jack, Smart Card reader, ExpressCard 34 and SDXC memory card slot in addition to the four USB 3.0 ports and two Thunderbolt 3 ports. Hopefully, with the power of Intel's Xeon family of processors on a laptop for the first time and the assortment of ports on the ThinkPad P70, you can leave behind your desktop workstation without compromising on productivity when you travel or work remotely. Gone from the prior ThinkPad W Series is the swappable Power Bridge Technology battery. This means you can't replace a depleted battery for a fresh one while you're working in the field, but fortunately the new Intel processor promises better battery life. Lenovo rates the 8-cell battery for between five and six hours of use. Likely, you'll still want to be within range of a power outlet as this won't get you through a full work day. The cost to having this much power is size and weight. The ThinkPad P70 comes in a 7.6 pounds (3.4kg) and measures 16.4 x 10.8 x 1.2 inches (416 x 275.5 x 31.5mm). Equipped with a 15.6-inch display and 4K UHD resolution, the P50 shares many of the features that make the P70 a great desktop replacement, including a Xeon processor, dedicated Nvidia Quadro graphics, 64GB DDR4 RAM and maximum 3TB storage. The ThinkPad P50 has all the connectivity of the larger P70 except the two Thunderbolt 3 ports. You can configure the ThinkPad P50 with either a 4-cell or 6-cell battery. Lenovo rates battery life at 3.6 hours with the smaller battery and six hours with the larger capacity battery. Like the P70, the battery cannot be replaced. Lacking the swappable optical drive, the P50 is slightly slimmer than the larger P70. It measures 14.86 x 9.93 x 1.02 inches (377.4 x 252.3 x 24.5 - 25.9mm) and weighs 5.6 pounds (2.5kg). For users requiring production-quality displays, both ThinkPad P Series models feature an integrated X-Rite Pantone color calibration reader built into the keyboard deck adjacent to the touchpad. The screen can achieve 100% color gamut, according to Lenovo, and you can calibrate the display to achieve more accurate colors by running the pre-installed utility, shutting the lid down and letting the software read and adjust your screen's settings. For users working in environments requiring added security, Lenovo also has a new fingerprint reader. Whereas the older ThinkPad W550s and ThinkPad W541 feature a swipe to scan reader, the new biometric scanner on the P Series requires you to touch your finger to the reader to scan. The new reader takes up more surface area, but is far easier to use, said Flynn, because it doesn't require you to hold your finger at a specific angle or swipe your finger at a specific speed. If you've used a ThinkPad notebook before, you'll be delighted to know that Lenovo's excellent keyboard makes a return on the P Series, featuring full-sized island-style keys with curved key caps and comfortable key travel. The P Series make use of dual mouse input with a red TrackPoint nub and also a trackpad. Unlike the recent ThinkPad W541 and ThinkPad W550s, the trackpad features three buttons, rather than just a large clickable surface. The ThinkPad P70 starts at $1,999 (£1,281, AU$2,696) and the ThinkPad P50 starts at $1,599 (£1,025, AU$2,156). Both laptops will be available in the final quarter of this year.